Everyone who has ever built a layout has had to overcome that one thing they don't enjoy or maybe even dread. That may be bench work, electrical, scenery, laying track, scratch building or putting kits together. The thing I dreaded most was having to paint my back drops. I procrastinated as long as possible which turned into about 9 years. My version of drawing a person is a collection of 5 straight lines, 3 circles and a curve. If I had been an artist I may never have gotten into model railway modelling as painting would be an enjoyable hobby on it's own. So that being said I had to find a way to overcome the fear of painting backdrops. 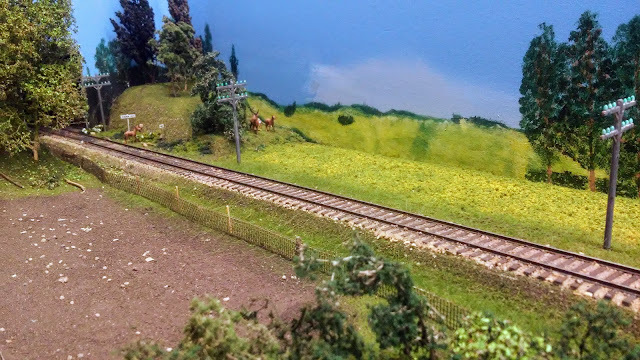 I started out by asking my friend Norman how he managed to paint the backdrops on his CN Clearwater Sub layout which is set in interior BC with low mountains. Norman was very supportive and told me you just lay down some sky and then just start adding the hills, a little shading here and there blending it in to the scenery. You can do most of this with a 1" paint brush and a couple of other smaller brushes to paint trees. Norman doesn't claim to be an artist but this was all very helpful. But I still had very little confidence. So Norm and I had this conversation a few times before I felt brave enough to paint. The picture below is a sample of some of Norman's backdrop. Looks pretty good to me. I then went though the same process with Warren who's layout is Alberta Pacific Railway (I don't have a picture of his backdrop but trust me it looks just as good). I also admired the layout at the EMRA in Edmonton. But I was still not feeling it. All of these layouts are so well done and the guys were very supportive. My first work around not painting was to look at photo murals but I was not going to get what I wanted easily. I was also not 100% sure what was going where and it was going to be very expensive by the time I was done. So I started by painting the blue sky with some white blended in to lighten it up at the horizon, this was easy enough and was completed in 2007 after I had laid down the basic scenery profile. It stayed like this until 2012. I knew that this was never going to keep me happy so in 2012 I had my first attempt at painting clouds behind my town site. This space is 3' deep and has a bit longer reach to the corners. I also realized that I was going to have to figure out how to paint through the corners. Awwghh more problems. It was always in the back of my mind that this was going to have to be completed and I was going to run out of time as I wanted to start working on the town. As you can see the clouds looked ok but I felt they needed to look better. So I began to research on how to paint clouds better, thinking that might be all I required. At the same time that I was looking at clouds I was also looking at other parts of the scenery in some pictures that I had taken. I realized that on the prairies I would most likely only have to paint things about 3-4" high because the prairies are mostly flat. My other big fear was the painting of the 2 coulees, and a couple of low spots behind bridges where there are more angles and the need for perspective to give depth. I knew this would be difficult. I watched You Tube videos, got a couple of books from the library and looked at hundreds of pictures that I had taken or saved from the internet. My confidence grew as I bought brushes and acrylic paint in colours that I learned I would need. My daughters small easel worked well to hold inexpensive Bristol board, which I used to practice painting landscapes on. 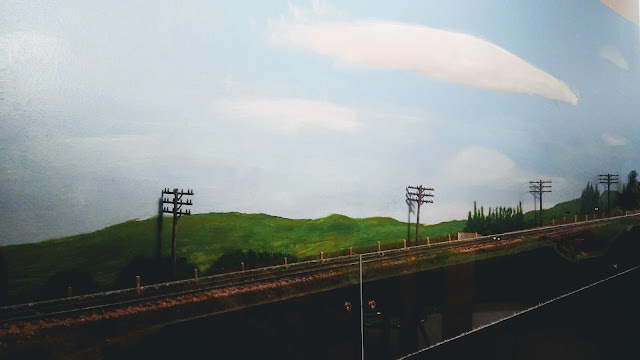 By early 2016 I had considered more work arounds, I thought if I planted lots of trees against the back drop I would not have to paint anymore. So I amassed some trees and started planting them to give it a try. 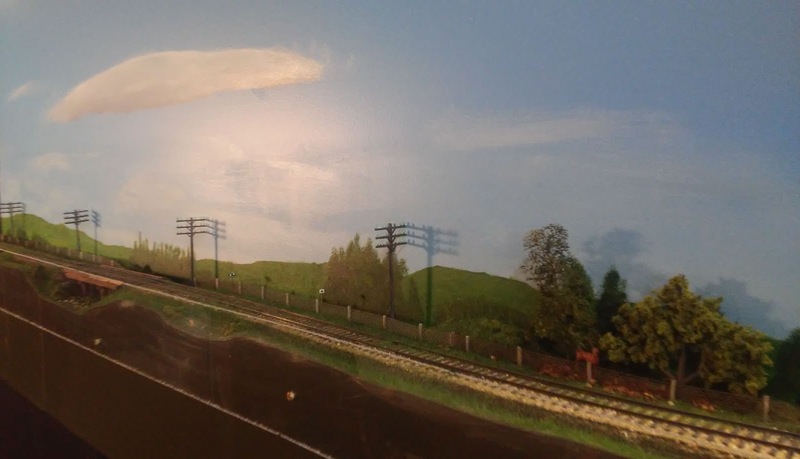 I soon discovered that this was going to take up a lot of space and in one spot I have a shelf that is only 4 1/2" wide and the trees would infringe on the track. Agh.... In Nov 2016 I started painting some better clouds. Which I was happy enough with and it was not really that difficult once I got going. Next I decided to go to work behind the town, the farm and another coulee behind my wood trestle. 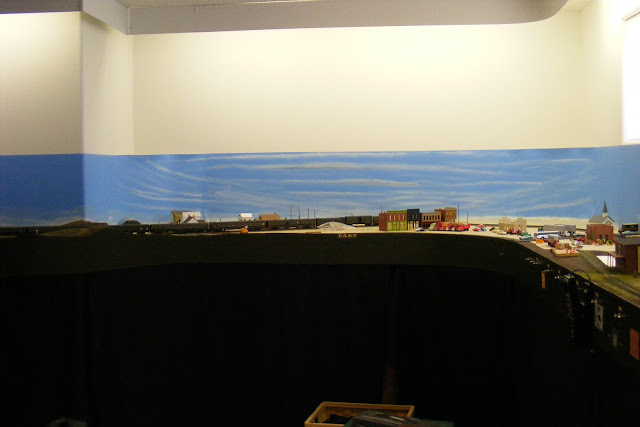 I needed to finish this section as this was going to be the area that I was going to use for my NMRA Scenery AP. I was still learning little things as I went along. I stay away from detail mostly because it is one thing to paint using an easel, right in front of you, and another having to reach back to the wall. These next pictures show the painting as it progressed, not the finished scene. The seam you see in the middle of this picture is how I did my corners. They are all curved by gluing Bristol board on to the wall in a curve into the corner. This worked really well and has stood up for 11 years so far. When you see it in person you really don't see the seam. Thus I have no 90* corners. This next video is of the completed scene from the town to the farm. So this is what I have learned through this process. -I have to be in the mood to do it, but this applies to lots of things for me. If I am in the mood it usually goes easy. This is maybe a little more intense since you have to engage your artistic side. -none of this painting will equal that of Max Jacquard's but then my whole layout is not museum quality either, so that's ok.
-I now paint a short piece and then do most of the scenery in front. This way it will look different as you go along and you have time to think about it. -I never weather more that 1 or 2 cars at a time or they start to look the same and can be affected just by the mood I am in. -the point in having the backdrop is not to steal the show but to give depth and to enhance the foreground. This is a picture of the narrow shelf that I was talking about before. I just finished this last week. I apologize for the shadows, it is a tough place to take a picture from and yes there is plexiglas on the front edge. I hope you enjoyed this post. Any questions you can email me or add a comment.